It’s no secret that we love grilled cheese here at our house. But, I never make straight up grilled cheese with American cheese on white bread. Ever. I always mix it up with different breads, usually something really grainy with great texture, various cheeses, and other yummy fillings. 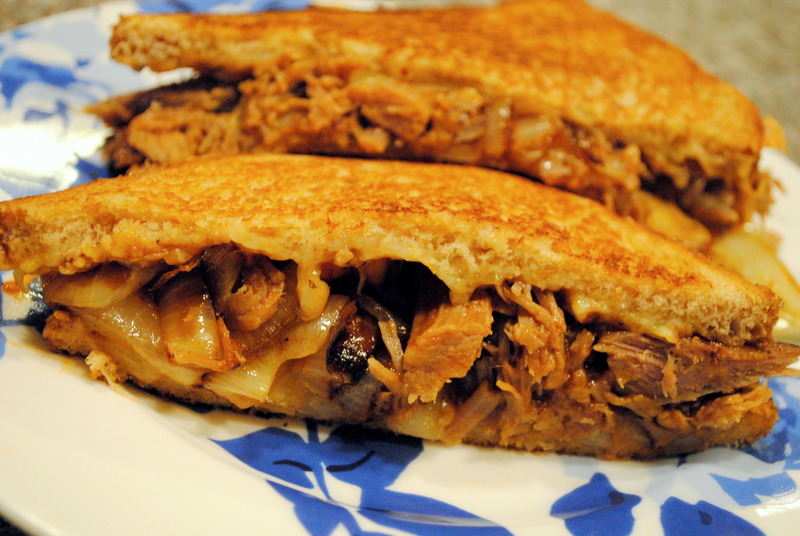 This time, I went a pretty hearty route with some pulled pork I had in the freezer and topped it with some delicious, sweet, caramelized onions, and of course, mixed shredded cheddar cheese. 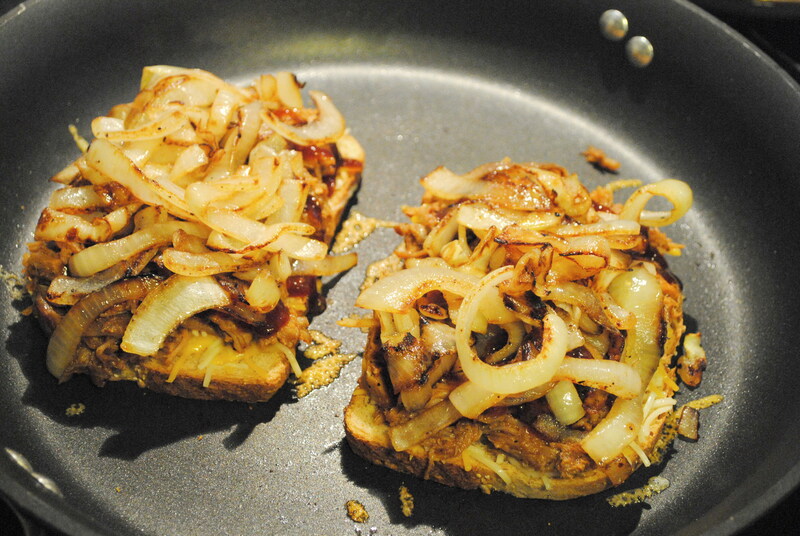 If you have never had caramelized onions, you slow cook them over low to moderate heat for 20-30 minutes, and they get all golden brown and super sweet. They don’t really taste like “onions” once they are caramelized. The verdict: this was uh-maze-ing! 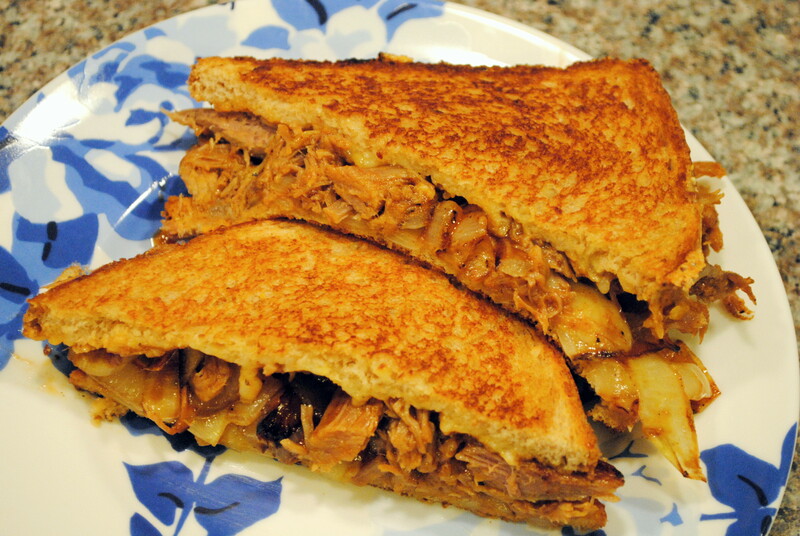 The sweet and savory flavors of the pork and onions really complimented each other, along with the melty sharp goodness of the cheese, topped off with the perfect crunch of that toasted bread. Oy! And the best part was I didn’t have to go to the store at all – I already had everything I needed in the fridge. 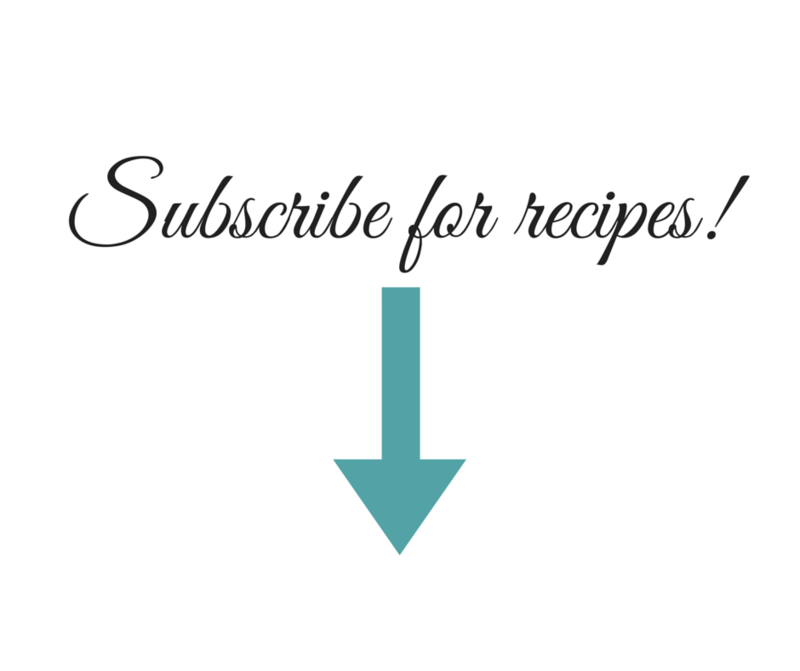 It’s a great use up for extra pulled pork you may have on hand if you’ve used my Crock Pot Pulled Pork recipe (which, by the way, is super easy and fool proof – and you can even skip the brining step if you want). 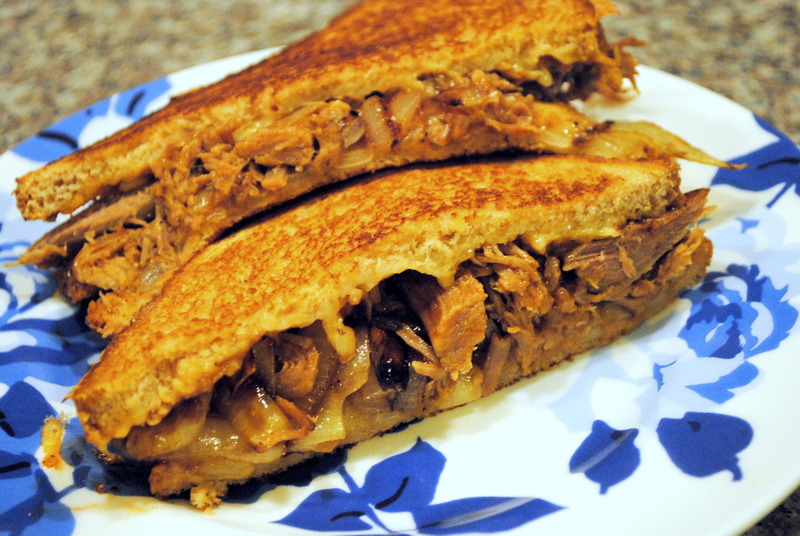 So maybe this weekend, give the Crock Pot Pulled Pork a try, and then this week you can have Pulled Pork Grilled Cheese with Caramelized Onions! It’s super quick and easy for a delicious weeknight meal! Now obviously, I did not measure when I made this. I’m going to try to give some approximate amounts, but clearly you can put on as much cheese and pork as you want. In a nonstick skillet, heat one tablespoon of extra virgin olive oil with one tablespoon of butter. Once the butter is melted, add sliced onion and cook on low for 20-30 minutes, stirring occasionally, until onions are lightly browned and caramelized. Heat a nonstick skillet over medium low heat. Spread margarine or butter on one side of each piece of bread. (I like to build the grilled cheese right in the skillet, but you can do it on a plate and transport it to the skillet if you like.) Place two pieces of bread, butter side down, in the skillet. Top each piece with one fourth of the cheese, followed by half of the pork, half of the onions, then another fourth of the cheese, and the last two pieces of bread (butter side up). Grill over medium low heat for 5-7 minutes each side, or until the bread is toasted to your liking and the cheese is melted.